Reserve Bearway To Heaven Today! The cabin was awesome. Kids loved the game room loft upstairs. We didn’t want to leave. Only thing we noticed was there were no extra garbage bags (just had to dump garbage in the outside can and reuse the same bag - not a huge deal) and there was no dish soap- plenty of dishwasher soap but sometime just needed to wash a glass. Overall I’d would definitely recommend this cabin and we would stay here again. Our family thoroughly enjoyed our stay at Bearway to Heaven. My father in law and I spent most of our time sitting outside by the fireplace. The only issues we had were very minor cosmetic or amenity issues. The grate over the microwave door was loose, and would fall off any time the microwave door was opened and shut. Also, one of the rocking chairs had some loose nails, causing the seat to be unsafe to sit in. Again, minor cosmetics, but overall we LOVED the property and will definitely be booking with Cabins USA in the future. Thank you so much for such a relaxing weekend get-a-way. This property is great!!!! The only suggestion would be new pillows on bed and new comforters. They were very worn down. Also new throw pillows for couch. Road 30 foot from back of cabin and another 30 foot from front of cabin. Furniture and pool table stained. Price was good. Service was good when TV wasn't working. To be honest, I was a little worried about the location at first, as I usually prefer to be a little more secluded. But the neighboring cabin and close resident are hardly noticeable at all. It felt very private. The only thing I would change is the local resident to the south has a street light in his yard that is noticable in the evenings, but hardly a disturbance at all. The only other thing I could complain about was having to email the office to get the wireless password, which I eventually found written on the inside of the handset of the landline phone. It should be posted in a more obvious location. But overall, I would return to this cabin in a heartbeat. It felt very luxurious for my taste and very affordable compared to other cabins of the same caliber. internet needs work, we had no connection but we weren’t in the cabin a lot but all in all it was a nice cabin. Our family had a great time in our cabin. We will certainly be using Cabins USA again. We absolutely loved the cabin. Our 5 yr old grandson had a blast playing the vintage arcade games; and he was so fascinated with the see-through fireplace from living room to porch. The beds, however, were not comfortable at all. Other than that, we had a wonderful stay. We loved "Bearway to Heaven"! My boys stayed upstairs with their Papaw and played pool the entire time. They didn't fight or want to play video games, which is amazing! Check-in and check-out were super easy with no problems at all. The hot tub was perfect and the beds were comfy. There was a slight problem, however. We spotted a few cockroaches in the kitchen and bathrooms. We didn't feel the need to call in and make a big fuss. We just moved all snacks to the fridge and fumigated our car when we got home. I called in to the office when we returned home to let them know that the cabin needed to be treated to get rid of the cockroaches. We really enjoyed our stay at Bear Way to Heaven. Very clean and had everything we needed to make our vacation a great experience. Location was great! Close to Pigeon forge and Gatlinburg attractions, but far enough away for peace and quiet after a long day of fun. The pool table and arcade games were a great addition for our stay there sense we awoke to snow flurries our first morning there, we made good use of them. The hot tub was great,very relaxing. Loved the text check out! I will definitely recommend USA Cabins and Bear Way to Heaven to family and friends. Had bedbugs but staff didn't believe me because they didn't find them. You're not going to find them under the bed during the day... you have to actually take the matressss and sheets off. Glad there was no fight to move cabins though. Over all a good experience. I just happen to be more sensitive than most when it comes to big bites and I hate that the building won't be taken care of before the next guests. Location and cabin was very nice enjoyed our stay downstairs bed was very uncomfortable, otherwise everything was very nice. Staff was very polite and accommodating. Will stay again. Thank you for taking the time to let us know about your recent stay in Bearway to Heaven! We here at Cabins USA strive to give each of our guests the best stay possible while vacationing in the Smokies. Thank you for letting us know about the condition of the mattress. Your comments have been forwarded to our Owner Liaisons who will be bringing this to the owner's attention. When you are ready to stay with us again, please mention you are a return guest for an additional discount. Thank you again for your review and thank you for choosing Cabins USA! 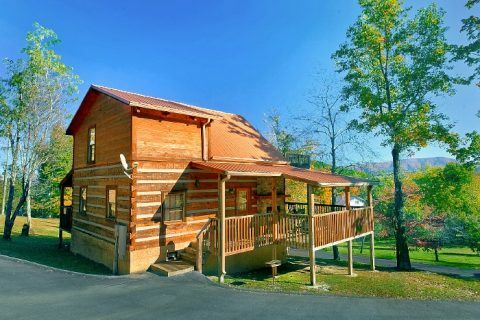 This cabin was located in a convenient location to Pigeon Forge, Dollywood and Downtown Gatlinburg. My family of 4 thoroughly enjoyed our stay here. Amenities were great, location was quiet and the convenience to things to do was impressive. My only complaint is the pillows in the upstairs bedroom were not up to par. I would definitely recommend this cabin. Thank you for all of your kind words! We here at Cabins USA work hard to make sure each of our guests have the best stay possible while vacationing in the Smokies. Thank you for letting us know about the condition of the pillows. Your comments have been forwarded to our housekeeping department to be addressed. When you are ready to stay with us again, please mention you are a return guest for an additional discount. Thank you for choosing Cabins USA and we look forward to seeing you again! We loved our stay at Bearway to Heaven...the only suggestions I would have is more towels and some better pans...the ones there are scratched really bad. We had to go out and buy some so we just left them there for the next visitors.😀 The kids and the adults loved the game room...the mrs. Pac man game was a hit. We plan on coming back at Christmas and we will be using USA Cabins again. My family had a great vacation! Good location not too far in the hills. I am so happy to hear that you enjoyed your stay in Bearway to Heaven! We here at Cabins USA work hard to make sure each of our guests have the same great stay you enjoyed while vacationing in the Smokies. When you are ready to stay with us again, please mention you are a return guest for an additional discount. Thank you again for your review and thank you for choosing Cabins USA! I loved the cabin and the location is quick to downtown! However, the beds are so horrible we left a night early. We couldn't make it sleeping there more night. There was no pot holders, needs more towels left for guest and needs to be sprayed for bugs. Also, there's no way to work the tv in the living room. Had to change the channel by standing in the downstairs bedroom which is really inconvenient when others are asleep. I saw a lot of reviews where people complained about the commute to the cabin. Although, it was 5 minutes from downtown, I enjoyed the beautiful drive and thought it was wonderful. The beds in the cabin is the reason for the low scores. The mattress' are terrible. We stayed upstairs in the King bed at first and I could not do it another night. We ended up sleeping downstairs in the queen bed, but the queen mattress was not all the great, but way better than the king. If anyone has toddlers I don't recommend visiting the cabin without a baby gate. The stairs were a nightmare and a daily child barricade battle. The check in was great, although there was nothing provided to me about check out. I called the company on the way home to see if there was anything I had to do and was told I needed to text a number, which was provided to me during check in. I did check in via email and not in the office, so I was not given anything or instructions. I would of hoped that information would have been left in the cabin upon my arrival. This cabin was just what we were looking for. Easily accessible to town, about 10minutes, and easy roads to navigate. We had a lovely mountain view. a few things to mention are: there are 2 roads that pass the cabin, so you do hear some road noise. The cabin has no wi fi, I thought maybe it was just a weak signal, but possibly it isn't advertised as having Wi-Fi. it was mentioned by another guest in April about not having potholders, there still aren't any, as well as not enough forks, only 4.....simple things to fix. it is true also that the mattress upstairs needs replacing. We loved the 2-way fireplace and the coziness of the cabin. have stayed with Cabins usa 2times now, and would definitely book again. Thank you for taking the time to let us know about your recent stay in Bearway to Heaven! We here at Cabins USA work hard to make sure each of our guests have the best stay possible while vacationing in the Smokies I apologize for the lack of pot holders and forks. Your comments have been forwarded to our housekeeping department to be addressed. Thank you again for your review and thank you for continuing to choose Cabins USA! Everything was wonderful: only the upstairs bed was a little wore out and not enough towels for 6 people. Thank you for taking the time to let us know about your recent stay in Bearway to Heaven! We here at Cabins USA work hard to make sure each of our guests have the same great stay you enjoyed while vacationing in the Smokies. Your comments about the bed have been forwarded to our Owner Liaisons and they will be bringing that to the owner's attention. When you are ready to stay with us again, please mention you are return guest for an additional discount. Thank you again for your review and thank you for choosing Cabins USA! Need better lighting outside to find at night. upstairs bed needs replaced its bad. the stand up arcade game didn't work. the hot tub wouldn't get hot . there is no wifi in or around the cabin. bottom bedroom is very small. Beautiful property! It is very relaxing and semi-private which was fine with us. We met some of the neighbors and got some history of the area that took us on an adventure. As always it was easy to book all the way through check out. Love Cabins USA! The experience with the company alone makes you want to come back. We will definitely be back soon. I am so happy to hear that you enjoyed your stay in Bearway to Heaven! We here at Cabins USA work hard to make sure each of our guests have the best stay possible while vacationing in the Smokies. When you are ready to stay with us again, please mention you are a return guest for an additional discount. Thank you for choosing Cabins USA and we look forward to having you as our guest again! Cabin has was the cleanest I have ever stayed in and we travel a lot. The location was a bit off the beaten path and a drive into town, but if you are going to the Smokey Mountains, nice alternate route from the cabin (vs. sitting in traffic through Gatlinburg). For the most part well stocked, although I didn't notice there were no hot pad holders until I need them --oops. Great views from the cabin and indoor/outdoor fireplace is a nice feature! Thank you for all of your kind words! We here at Cabins USA work hard to make sure each of our guests have the best stay possible while vacationing in the Smokies. Thank you for letting us know about the lack of pot holders in the cabin. Housekeeping has been notified and will be correcting that issue. When you are ready to stay with us again, please mention you are a return guest for an additional discount. Thank you for choosing Cabins USA and we look forward to having you as our guest again! The cabin was very clean and that's a plus for me. I did not enjoy the fact that there is only 1 shower and you have to go downstairs to use the shower. The other issue is the master bedroom is a loft and offers no privacy along with no shower. Also the game room is located in the loft so our boys were constantly upstairs in our area and if we wanted to turn in early that was a bummer for them. Last but important- there was no wifi and most everyone these days depend on wifi. My husband owns his own business and he wasn't able to access anything while we were away. Our family of 4 had such a nice vacation at Bear way to Heaven cabin. It was close to all the tourist attractions, yet far enough away to enjoy the mountin scene in peace. The staff were very friendly and helpful! I highly recommend Cabins USA! The house was awesome. Had and issue with the Air Conditioning and that was handled promptly. However, both of the beds need new mattresses. Dealing with the office staff was great. I will be using Cabins USA again. It is a nice cabin. Had lots of fun. I have two complains ...the stair way is steep and need better pillows. Our queen size felt like it was half of a pillow. Only one set of pillows for each bed. Beside that it was nice. Thank you for taking the time to let us know about your recent stay in Bearway to Heaven. We here at Cabins USA work hard to make sure that each of our guests have the same great stay you enjoyed while visiting the Smokies. Thank you for letting us know about the pillows at the cabin. Your comments have been forwarded to our housekeeping department so that issue can be resolved. Thank you again for your review and thank you for choosing Cabins USA! We had a wonderful stay at Bearway to Heaven. The cabin itself was very clean. The hottub, on the other hand, is in need of a cleaning. It was fine until we turned on the jets. Also it would be good to know that the upstairs bedroom is not a closed off room but more like a loft. Still a very nice cabin. We loved the view and some of our favorite times were sitting on the porch enjoying the 2-way fireplace. It was perfect for the rainy days we spent there. Thank you for all of your kind words and I am happy to hear that you enjoyed your stay in Bearway to Heaven. I apologize that your hot tub was not clean. I have forwarded your comments on to our housekeeping department to ensure that each of our cabins are be cleaned to not only our standards but also the standards of our guests. When you are ready to stay with us again, please mention you are a return guest for an additional discount. Thank you again for your review and thank you for choosing Cabins USA! This was our first time booking with Cabins USA We had a great time and our cabin was awesome. The kids loved the game room and there was just enough room for our family of 4 to rest and relax. We will definitely stay here again. I am so happy to hear that you enjoyed your stay in Bearway to Heaven! We here at Cabins USA work hard to make sure that each of our guests have the same great experience you enjoyed while vacationing in the Smokies. When you are ready to stay with us again, please let our reservationists know you are a return guest for an additional discount. Thank you again for your review and we look forward to having you as our guest again! cabin was overall nice. everything worked there was a few light bulbs blown or missing. the bed upstairs was to soft for someone with bad back and i woke up with pain. the upstairs bathroom didnt have a shower. other than those things the cabin was great. hot tub in good shape, pool table in good shape. parking was great. the location was pretty good not to far from town. The staff was super friendly and accommodating. The cabin was clean. The only complaint was the garden tub upstairs drained slow. I would definitely book this cabin again. Thank you so much for all of your kind words and I am so happy to hear that you enjoyed your stay in Bearway to Heaven! Our housekeepers work hard to make sure that each of our cabins are thoroughly cleaned and fully stocked so all you have to do is walk into your cabin and start relaxing. Thank you for letting us know about the garden tub. Maintenance has been notified and will be correcting that issue. Thank you again for your review and we look forward to having you as our guest again! Bearway to Heaven is a great cabin. Modern rustic furnishings. The owner takes very good care of the cabin. Everything was clean and comfortable. The cabin was just like the pictures. The game room amenities added a lot of extra family time to our trip. The kitchen was fully stocked with utensils, pots, pans, etc. I would definitely stay here again. Recommend adding a DVD player to the tv in the family room on the first floor. I am so happy to hear that you enjoyed your stay in Bearway to Heaven and thank you for all of your kind words! Cabins USA and the owners of our cabins work hard to make sure that each of our guests have the same wonderful stay that you enjoyed while visiting the Smokies. When you are ready to stay with us again, please let our reservationists know you are a return guest for an additional discount. Thank you again for your review and we look forward to having you as our guest again! Cabin was amazing. It is perfect for a romantic weekend. Would love to come back in the fall. Great price and location was good. Thank you for your feedback on your cabin Bearway to Heaven. We are glad that you enjoyed your Smoky Mountain experience with us. We look forward to having you stay with us again in the fall. One item to consider is putting up some curtains on the big bay window upstairs. Sunlight comes through in the sleeping area very early in the morning. Everything else was great. The staff at Cabins USA are the Best! A check up call to see how everything is. That is a great touch. Enjoyed our stay, we will be back and use Cabins USA again. Thank you for your kind review! Our guest service agents appreciate being noticed for their hard work. I am so happy to hear that you enjoyed your stay in Bearway to Heaven and we look forward to having you as our guest again! We really enjoyed our stay in Bearway to Heaven, it was easy to get to and location was great. Only thing we wish was privacy boards on each end of the porch for more privacy in the hot tub......especially during the daytime. My daughter loved the Mrs. Pac Man game upstairs.....would stay in the cabin again. My husband, mother in law, niece and I stayed in this cabin for 4 nights. And we absolutely loved it! The location was perfect. Not too far away yet close enough to the parkway. The beds were super comfortable. The hot tub was amazing. The cabin in general was amazing and cozy. However, the cabin details offer WiFi and an upstairs fireplace in the master bedroom. The fireplace didn't work and neither did the WiFi. I called the office and they sent someone from maintenance out the next day. He didn't get the fireplace to work, which wasn't a big deal, but he also didn't get the WiFi to work either. He said he would get ahold of the cabin owner and get back in touch with me, and never did. So needless to say, we had no WiFi the whole time we were there. And the cell service isn't very good. When we chose this cabin, WiFi was one of the things we looked for the most. I don't know if it got fixed after we left. Overall, we had an amazing time playing pool and sitting by the working fireplaces downstairs. Had the fireplace upstairs and the WiFi worked, this would have been the perfect cabin. This makes our 2nd time staying with CabinsUSA and we will return next year. Thanks for such an amazing stay! Verry nice did not want to leave.